ConServ Energy Group, LLC in 2012 has proposed to install a turnkey RTO Heat Recovery Project at the plant to capture the waste heat being thrown off and wasted by the RTO six foot diameter stack which burns the volatile organic compounds coming off the paint booths. Our side-stream heat exchanger system uses unique metals and proprietary technology that allows us to capture approximately 70% of the sensible and latent heat going up the stack. Our system can be 2 to 3 times as more efficient than conventional stack gas economizers. 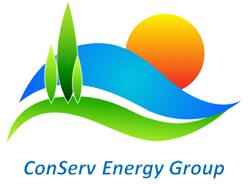 Since our technology is proprietary, we require that ConServ Energy Group and our partner mechanical contractor provide a complete turnkey installation. The total turnkey cost of our RTO Heat Recovery Project is $ 887,333. The gross savings figures to $ 535,181 per year with natural gas prices figured at $5.00 per MCF. However, our system will use 4-15 h.p. stainless steel fans and a 50 h.p. water pump for 7446 hours of operation per year which allows for plant shutdowns when the RTO would not be in operation. The calculated electric energy cost of our fans and pump is $40,957 per year. Therefore subtracting the electric energy cost from the gross savings, leaves a net savings of $ 494,224 per year. Therefore, the straight line payback for our RTO Heat Recovery System for this Automobile Plant is 1.8 years. For your information, on the next 2 pages I have provided the savings calculations that we made for this RTO Heat Recovery Project. Above data was verified for application of heat recovery. Calculations resulted in 61,409 SCFM & 95,420 ACFM at 20.8 % oxygen. Calculations checked close enough and provided greater confidence for further use. Enthalpy of stack gas at above conditions and with exit gas from the heat recovery equipment was provided by consulting the Buffalo Forge Company Psychrometric chart for “very high temperature”. Enthalpy for entering gas h1: 120 Btu/lb. Enthalpy for exiting gas h2: 50 Btu/lb. Selecting ~70 % of available stack gas: 43,000 SCFM. Using natural gas measurements, which were provided by plant personnel, it was concluded that the RTO system would operate 7446 hours per year. It was further assumed for purposes of this calculation that the cost of natural gas for the plant be a low number of $ 5.00 per million Btu. The plant energy manager agreed with the $5.00 cost. Further, due to our practical limitations of piping, pump, and flow selection (8 inch piping with 50 h.p. pump producing 1,750 gpm) through the heat recovery system, and the limitation of the coils within the heat transfer modules, the recovered heat worked out to be 10,062,500 Btu/hr. Therefore, when our RTO Heat Recovery System is operating, we will be recovering over 10 million BTU’s of heat per hour and transferring that heat into the boiler supply water loop which will in turn substantially reduce the required input by the plant’s natural gas fired boilers.